Time to taste the fruits of your labor, and share with your family and friends! 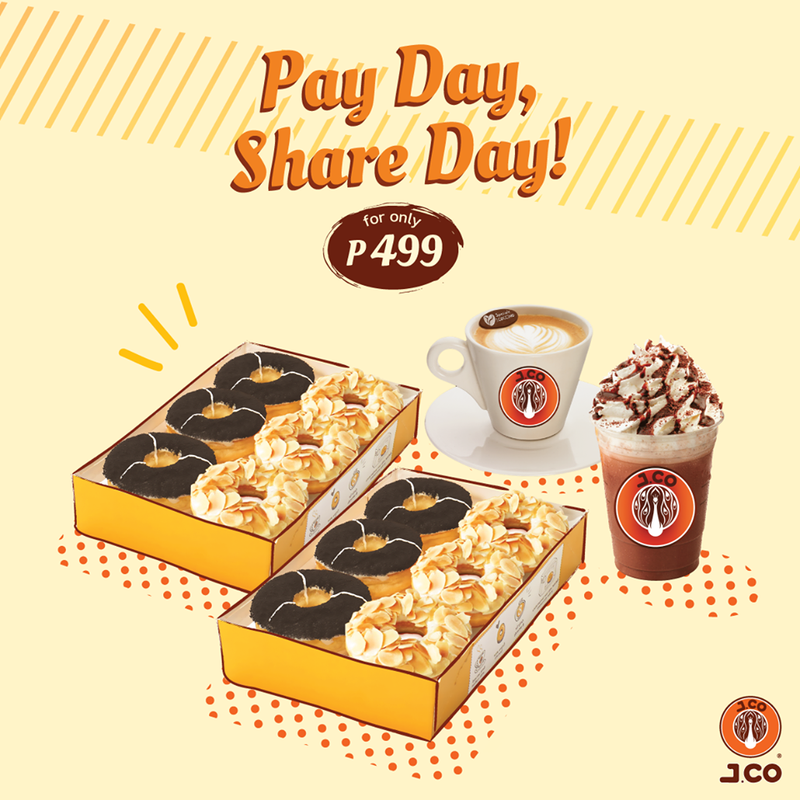 Check out J. Co's Payday Share Day Promo. Enjoy a delicious J.CO moment in Makati and Taguig on November 28 to 30, 2017. 1.) Purchase two half-dozen pre-packed donuts and two featured Jcoffee UNO size for only P499. 2.) Each half-dozen pre-packed donuts consists of 3pcs. Alcapone and 3pcs. Oreology. 3.) Featured Jcoffee: Hot Jcoccino, Iced Jcoccino, Hot Chocolate or Iced Chocolate. 4.) The promo cannot be exchanged for other items or discounts and cannot be used in conjunction with other promos. In the purchase of goods and services which are on promotional discount, the senior citizen can avail of the promotional discount or the discount provided under the Expanded Senior Citizens Act of 2010, whichever is higher. In compliance to, Section 4 of R.A. 9994, otherwise known as the Expanded Senior Citizens Act of 2010. 5.) Promo is valid from November 28 to 30, 2017 at J.CO Glorietta, J.CO Greenbelt 3, J.CO Paseo Center, J.CO Forbestown, J.CO Market! Market! and J.CO Kidzania.